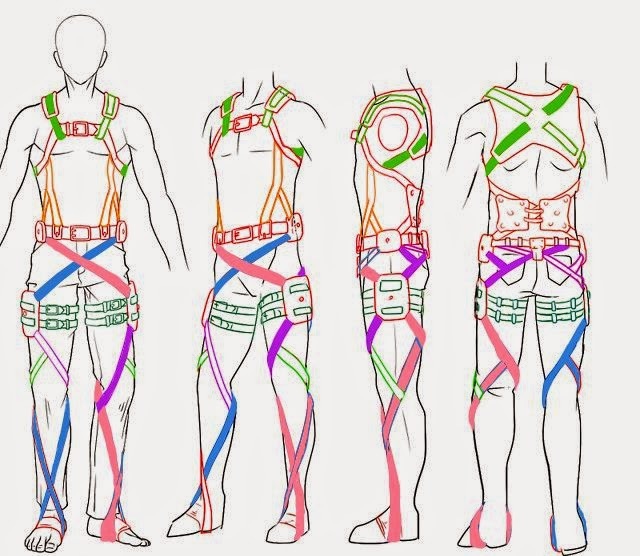 Assemble it on your body, not a mannequin or dress form. Trust me on this. I had to undo it twice because of this. Do one piece at a time and use binder clips to hold (needles just bend in this stuff). When you get frustrated, put it down and walk away. Work on something else. Just keep swimming! Or, er, sewing. Just keep at it. It's a pain and it's very frustrating, but the end product is totally worth it. So, have your reference picture close at hand because it will be very necessary! I started with the belt strap. Wrap it around your waist where you want it to sit (I have mine closer to my hips than waist to extend my torso since I'm so short). Mark where your buckle (or D rings, in my case) will be and install. I started with the top straps. Put your belt on. Using the reference picture above, attach a 1 in strap with a binder clip to your belt, wrap around your lower back and up under your arm. If you are happy with how it sits, sew. Repeat for other side. Now, my pictures are off because I assembled this on my dress form first, then disassembled it and redid it using my body. Forgive me for not taking pictures the second time (I was a wee bit frustrated). I would go ahead and install your buckle now. I didn't, which I found to be a mistake. Now, use 2" straps and make the shoulder part. Hold in place with binder clips, and when happy, sew. Do not clip off any extra strap. That way, if you've made a mistake that you don't realize until later, you still have room to expand. I used buttons to attach the shoulder straps. You can use buckles, if you'd prefer. I didn't want too much hardware/bling. If you go the button route, get a button hole foot for your sewing machine if it didn't come with one/you don't already have one. It makes sewing a button hole SO easy. Then, youtube how to use a button hole foot. To sew the button on, look in your sewing machine manual. Buttons were really simple, so I used them quite a bit for my harness. At the end there will be a link to a short video tutorial on using your sewing machine to sew buttons. I apologize for the shakiness and blurriness. I'm not an amazing videographer. Now, you can stick to the top part and complete it, or you can move on to the legs. I forgot about the suspenders, so I moved on to the legs, then came back and did the suspenders. 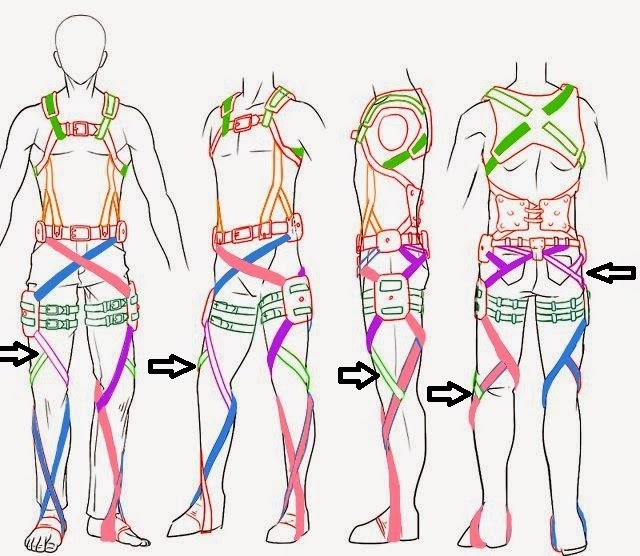 Study the reference picture and use it to guide you while you wrap a 2" strap from your hip, around your pelvis, behind your thigh, down around your calf and foot, and to knee area for attachment. It's difficult. Took me two tries before I was happy with it. Use binder clips to hold in place at belt and knee. When happy with it, sew together. DO NOT CLIP OFF EXCESS! Repeat for other side. Now, there is a thinner thigh piece that we're going to do next. Clip to your belt in the back, just off center. Wrap around and clip to thicker (solid blue in picture) strap at mid lateral thigh. Continue wrapping and clip behind knee. Once happy, sew in place. Do not trim. Repeat on other side. Now, let's go back to the top and make those suspenders. Use binder clips to attach one to the belt where you want it to sit. Bring to the chest strap. Stand tall, and clip in place taunt. It will be loose when you are not standing tall, but I'm better most of my posing will be done in salute, so this will work fine. Sew the suspender at the chest strap. Install buttons for the belt portion. I installed the buttons on the backside of the belt, and the button holes on the suspenders. Repeat for other side, or, just measure it out, if you know how to do so. If not, repeating the above will get you the same results. Back to the bottom. Install the decorative/holding straps in the back. I used my dressform for this. Sew in place. The basic harness is now done (yes, there are some straps yet to add, but they won't affect the fit you currently have). Try it on, and make sure everything fits. If it does, clip all the excess fabric using pinking shears. These will be added, along with the pieces I plan to make out of foam (the back piece, thigh pieces, etc) in part three of the tutorial.